After sharing Labor Day with the same friends at Center Lake in Beckett, MA for 22 years, we weren't going to break tradition this year. We stayed overnight at Cindy and Fred's lovely camp and enjoyed the best weekend of weather all summer. We went swimming and s at around a lot, making the kids deliver beer via kayak to the adults on the raft. The kids went kayaking and canoeing, and Fred took them all for tube rides. The tubing was a good test of Dr. Emani's surgical skills. She caught some big air and came crashing down. Nothing came loose so he must have done a good job. 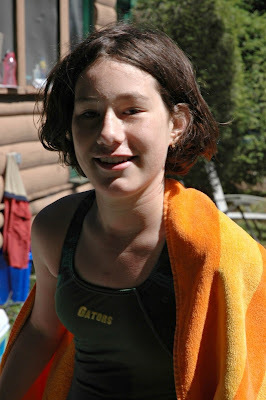 This picture shows her new high fashion haircut, but of course she just came out of the water here. We'll have to find one when she's dry and styled. The adults moved to shore and continued their inane conversations. At one point we insisted that anyone who sit with us could not say anything that sounded smart or provoked any thoughtfulness. A few hours of that can purge the mind and move one a few steps toward true enlightenment--at least nobody was driving. The kids played board games and after dark sardines--hide and seek where once somebody finds a kid they hide with the original kid who's "it" until they are all hiding together and trying not to giggle. Emily was the oldest in the group, which is pretty interesting because I remember when she was the youngest. All the formerly oldest kids are off to school or adult life. The next day we did some more swimming and sitting around. 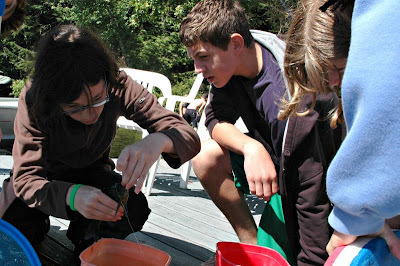 Emily was the one who had to show the other kids how to free a bluegill sunfish from a fish hook, as shown below. She started school yesterday and has now had all her classes. A little stress yesterday with her AP Chemistry teacher (second year of chemistry), who had no large print materials for her and seemed resistant to helping. Her heart transplant did nothing to fix her other medical problems, and the low vision makes it impossible for her to learn from regular books and materials. Although the law requires the teachers to provide her with the tools she needs, we have found a very wide range in enthusiasm for compliance. With the help of her guidance counselor and other support people we elected not to fight an unsympathetic teacher all year and she moved to Physics today, where the teacher is hard but fair. Her other teachers seem great, and we are looking forward to a year that goes a bit smoother than last year. Looking back from today, 9/11/09, I am first reminded of 9/11/01, when I was in Manhattan and saw the iconic Twin Towers crumble into rubble from a too-close vantage point in Midtown. I feel for the families of those innocent victims. As I look back on our own last year I remember sending Jeff off to college as a freshman, worrying if he will succeed, and if he will have a good time, like I did in college. We were reeling from the news from Dr. Maron that we should make an appointment to see the team at Children's about a heart transplant, "just in case." Fortunately Jeff did great without parental input, because our focus left him for the year. We were deep in denial. Emily seemed tired a lot but otherwise ok. We made an appointment for October and began reading about transplants on line. Very scary stuff--much of it old, made us view a transplant as a desperate act that might prolong death. However, some of the new stuff made it sound like a transforming procedure that let somebody lead a normal life and could reset their life's clock. We had a lot to learn. It sounds like Emily had a great summer and has now returned to "normalcy." I am shocked that the chemistry teacher would not do something to help Emily get the appropriate materials for something that is so objectively necessary. People like that should not be teaching!